WIKA's diaphragm pressure switches have been specifically developed for safety-critical applications. Manufactured to ISO 9001:2000 standards, our diaphragm pressure switches ensure reliable monitoring of your plant. Throughout the process, our pressure switches are traced by quality assurance software and tested. All wetted parts materials are from stainless steel as standard. 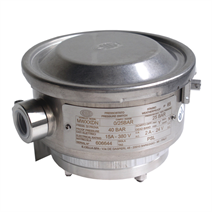 WIKA's family of diaphragm pressure swtiches is available in IP65, Ex-ia or Ex-d versions. To ensure as flexible operation, WIKA diaphragm pressure switches are equipped with micro switches, making it possible to switch an electrical load of up to 15 A / 220 VAC directly. For smaller contact ratings, such as for PLC applications, argon gas filled micro switches with goldplated contacts can be selected as an option. By using a diaphragm measuring system, the Model MW1 pressure switch is extremely robust and guarantees optimal operating characteristics. For applications requiring particularly high corrosion protection, diaphragm pressure switches with PTFE or Monel wetted parts are available.